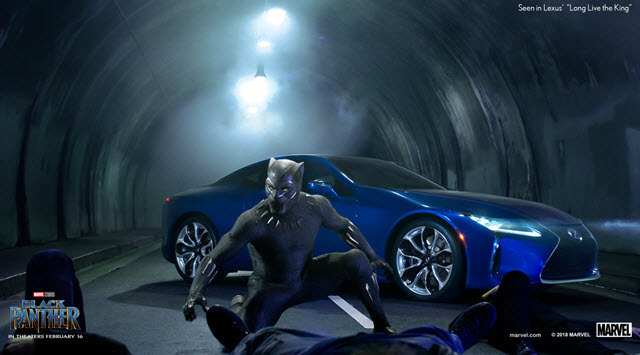 The Black Panther stars in a new Lexus Super Bowl ad called "Long Live the King." The commercial features the 2018 Lexus LS 500 F Sport. It stars Chadwick Boseman as T'Challa. The Black Panther is trying to recover stolen vibranium in the ad. Boseman also plays the Black Panther in the movie, which arrives in theaters on February 16. The ad also features actors Letitia Wright, Janeshia Adams-Ginyard, Marija Abney and Zola Williams. Mindy Hamilton, Marvel’s senior vice president of global partnerships and marketing, says in a statement, "With a character as important as Black Panther and a brand as iconic as Lexus, we knew that we had to rise to the occasion by creating something unforgettable. It’s a climactic moment for all of us as we come together to celebrate this wonderful collaboration and enjoy the big game."